Police had said Russian journalist Arkady Babchenko was fatally shot at his apartment in Kiev, Ukraine, on Tuesday. He is seen here in 2013. A Russian journalist who was reportedly gunned down at his apartment in Ukraine's capital on Tuesday showed up alive and well at a news conference some 24 hours later. "I'm still alive," Arkady Babchenko said Wednesday as he apologized to friends and family who believed he was dead. The Ukrainian Security Service said it faked his death to flush out people trying to kill him. 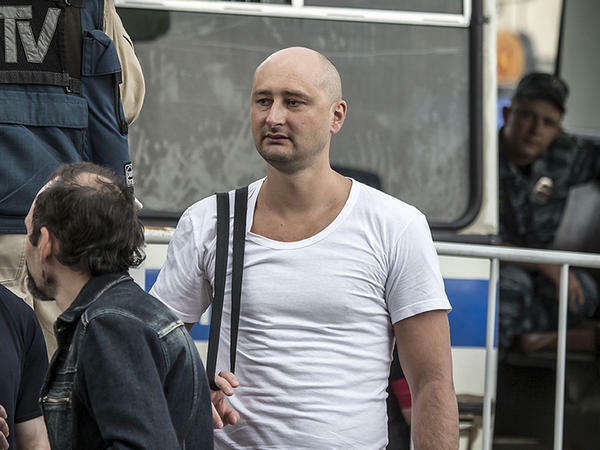 Russian journalist Arkady Babchenko was shot and killed on Tuesday in the Ukrainian capital. Kiev police told news outlets he had apparently been targeted for his work. The Kyiv Post reports that Babchenko was shot in the back: "His wife was in the bathroom when she heard the gunshots and walked in to find her husband wounded on the floor. She called the police. The journalist died on the way to hospital." Babchenko, 41, had been a prominent war correspondent in Russia, but had fled the country in February 2017 out of fear for his safety. He moved to Kiev in the fall, where hosted a program on a Crimean Tatar television network, the Associated Press reports. NPR's Lucian Kim reports from Moscow that before Babchenko became a journalist, he served in the Russian army's wars against separatists in Chechnya in the 1990s: "He was critical of Russia's military engagements in Ukraine and Syria and moved to Kiev with his family for their own safety. Babchenko's memoirs of the Chechen campaigns were published in English under the title 'One Soldier's War.'" In recent years, he became a highly vocal critic of the Russian government – a stance that put him at great risk. "All the elements of the propaganda machine were engaged. Channel One, Russia's most powerful state channel, called on its viewers to create a petition supporting the removal of our citizenship and deportation. In 24 hours it was signed by 130,000 people. "Then, the tabloid channel LifeNews collaborated with the courts to serve me with a fine for not buying a bus ticket – I am a war veteran, and enjoy free public transport as a result. Fines are a familiar tactic in Russia, often issued to stop someone from leaving the country because of their debts. "Then a 'beat 'em up game' emerged online where players are asked to 'deal with the enemies of the homeland using your own fists and boots'. These enemies have to be 'beaten until they fall'. I'm one of them." Ukrainian lawmaker Anton Gerashchenko wrote on Facebook that investigators would be looking at "Russian spy agencies' efforts to get rid of those who are trying to tell the truth about what is going on in Russia and Ukraine," the AP reports. Babchenko is the second journalist to be killed in Kiev in the last two years. In July 2016, investigative reporter Pavel Sheremet was killed by a bomb in his car. His case has not been solved. And in March 2017, former Russian parliamentarian named Denis Voronenkov, who had criticized President Vladimir Putin's government, was shot twice in the head on a sidewalk along a busy street in Kiev. Ukrainian President Petro Poroshenko said the killing was "an act of state terrorism on the part of Russia."